Publications about the future of food and farming are on the rise. I probably was just a little ahead of the pack with “Future Harvests – The Next Agricultural Revolution” that I published last August. First, I saw that it took 400 scientists and two years to publish the Foresight report titled “The future of food and farming: challenges and choices for global sustainability”, published on January 24. It is an interesting report. Then, on January 28, The World Economic Forum released the report titled “A New Vision for Agriculture”, which involved 17 global companies, 350 leaders of industry and 18 months. This one I read as a typical WFE document about the future agenda of these large corporations, really. I must say that having written my book in six months and not coming short of any of the points mentioned in both reports, I feel quite proud of my achievement. 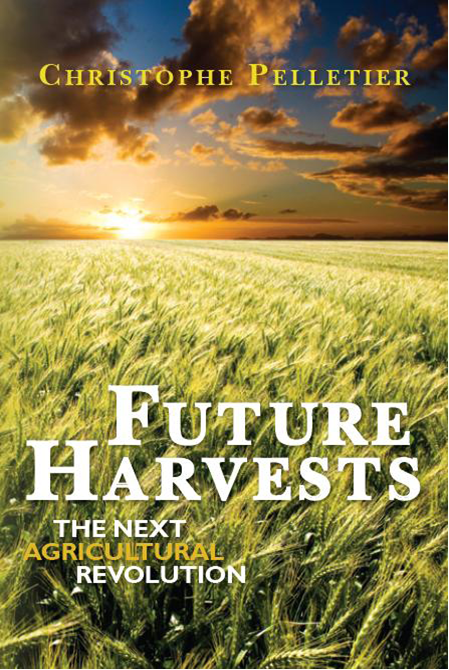 Future Harvests does not come short of any of the topics these reports address. In fact, these two reports come short of some critical factors for food security that I do mention in my book. From feedback that I received, Future Harvest appears to be even more informative and more fun to read than these reports. It looks like I did a reasonable job, then. For once, I will pay myself a compliment. Apparently, my company is the little consulting firm that can! That will be the slogan from now on. As this topic is gathering momentum, and more people are buying my book, I believe I should tell about the big picture and inform people about what is likely to happen in the future. This fascinating topic keeps an audience on their toes. I am available for speaking engagements to present this topic or any other related to it. This is a great story for any group interested in learning about trends and future developments in food production and food supply. So, if you and your organization, be it industry, non-profit or government, are interested in a presentation, please do not hesitate to contact me or to pass it on to someone who you know would be interested. This entry was posted on Tuesday, January 25th, 2011 at 8:54 am and is filed under Books by The Food Futurist, Food Security, Policies & Politics. You can follow any responses to this entry through the RSS 2.0 feed. Both comments and pings are currently closed.